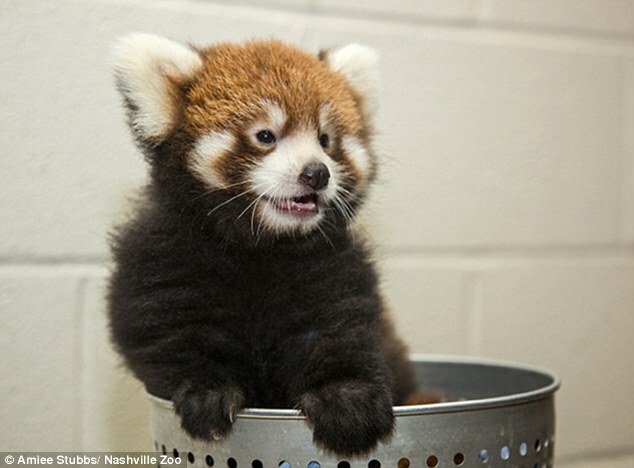 Nashville Zoo has welcomed a baby red panda after the the zoo's female red panda gave birth to a healthy female cub. Caretakers took a hands-off approach, monitoring the mother and cub through cameras hidden in the den. Red pandas have a high infant mortality rate, but 'the mother has done a great job of nursing and caring for the baby,' said carnivore supervisor Karen Rice. 'Red panda mothers are very prone to stress and easily agitated, which could cause them to reject or unintentionally harm the cubs,' she said. The female cub is doing well and bonding with her mother in their off exhibit den. Animal care staff monitored her for signs of stress and added video cameras to her nest boxes so that they would know when she gave birth and could watch for important things, like the cub nursing and possible overgrooming by the mother, all without having to disturb them. Visitors can expect to see the cub, which is the first red panda born at the zoo, this fall. At about 1 year old, the cub will likely leave the Nashville Zoo and be paired with a mate for breeding. The zoo's red pandas are part of the Association of Zoos and Aquariums' Species Survival Program, which manages breeding. Known for their teddy bear-like appearance and red fur, the red panda is native to the mountains of Central China, Nepal and northern Myanmar (Burma). They are considered vulnerable to extinction due to habitat destruction. In addition, slow rates of reproduction and high infant mortality rates make it very hard for this species to rebound from population declines.